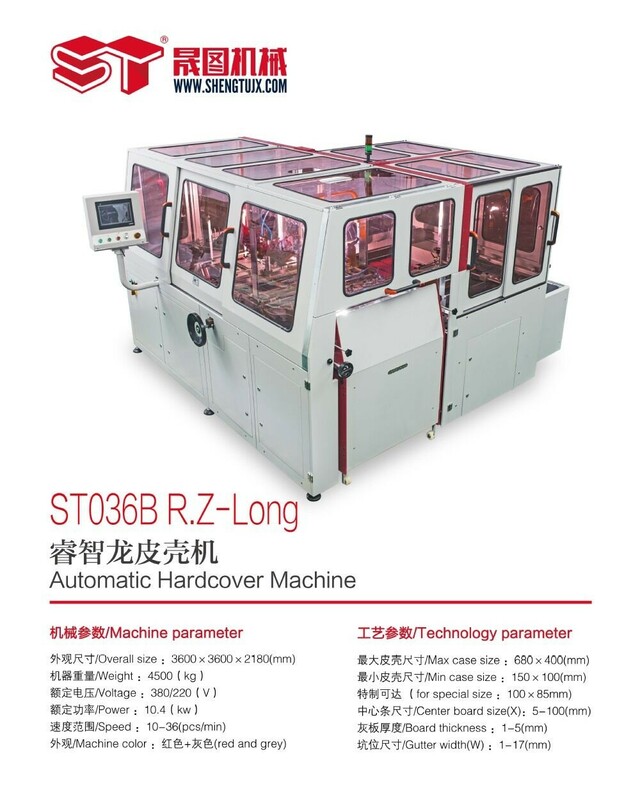 ST036B R.Z-Long Automatic Case Making Machine is specialized for producing lever arch files, wire-o notebook, notebook, diary, dictionary, hardcover book, gift box, phone box, mobile box, mooncake box, tea box, cigarette box, lever arch files box, ring box, watch box, wine box, desktop calendar, desk calendar, table calendar etc. 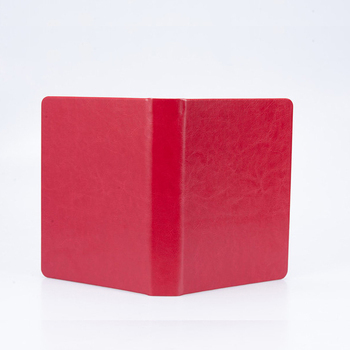 1.Can do notebook, hardcover book, gift box, phone box, mobile box, mooncake box, tea box, cigarette box, lever arch files box, table calendar, etc. 2.Can do different sharp, such as round corner, arc cover, triangle edge, trapezium edge and so on. 3.1—7pcs board setting according to your requirements. 4.Adopt Tow-ways leveling device can make hardcover more smooth and nicer. 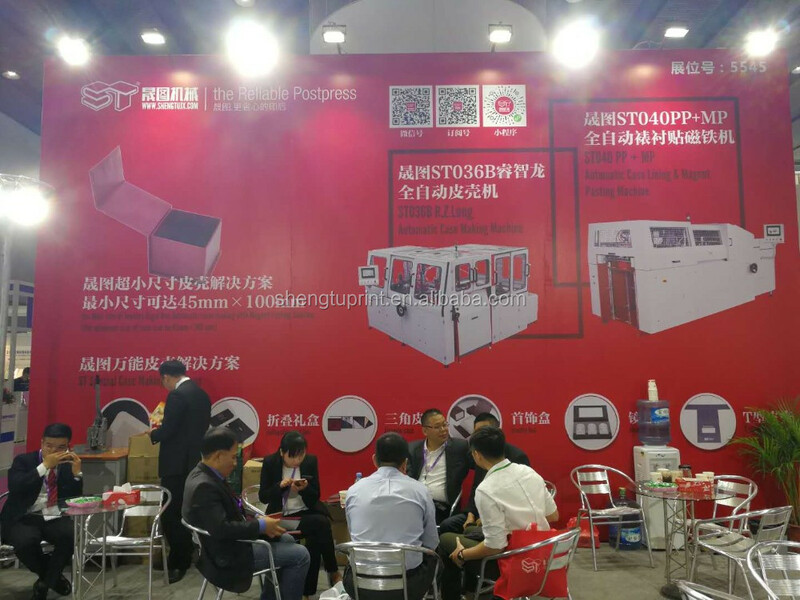 5.Intelligent control glue pre-heating device. 2. Automatic cover gluing, position-setting and side cladding for two grey boards, center paperboard. 3. Automatic oil lubrication system. 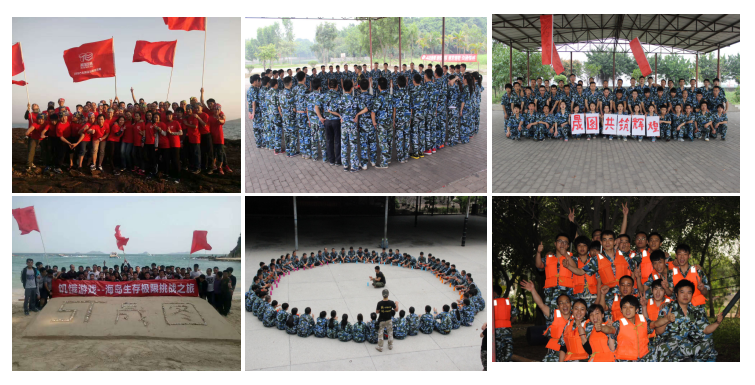 4.Taiwan BBM motor, IDELY transducer control system. 6. 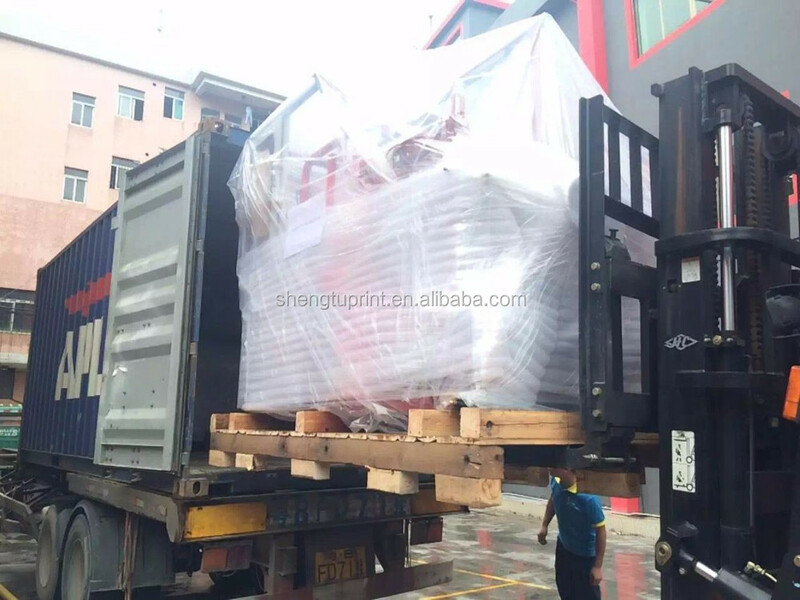 Automatic conveyor an cutting device of soft spine paper. 7.OMRON PLC, colorful touchscreen and transducer control system. 10. Number display adjusting device. 12. Board plate micro-adjusting device. 13. Automatic feeder adjusting device. 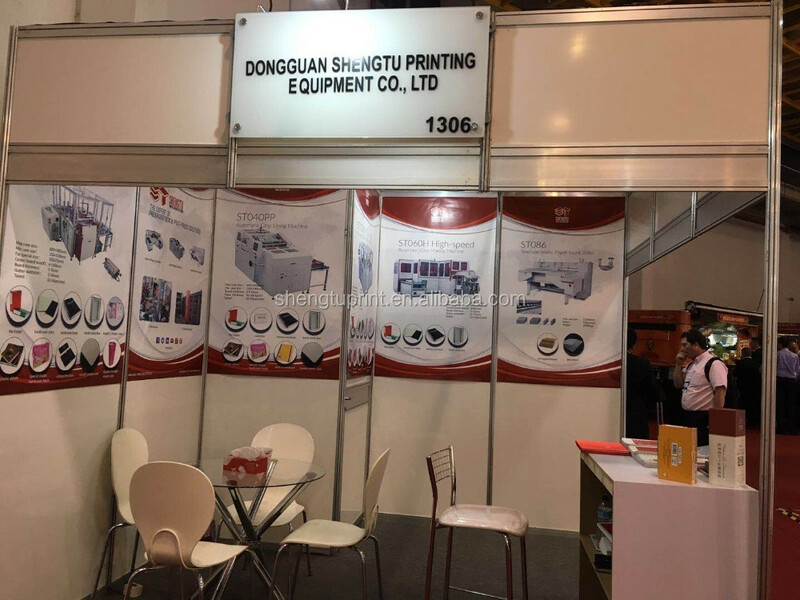 Dongguan Shengtu Printing Equipment Co., Ltd. is the leading supplier for manufacturing, selling printing packaging equipment as well as providing solution projects. 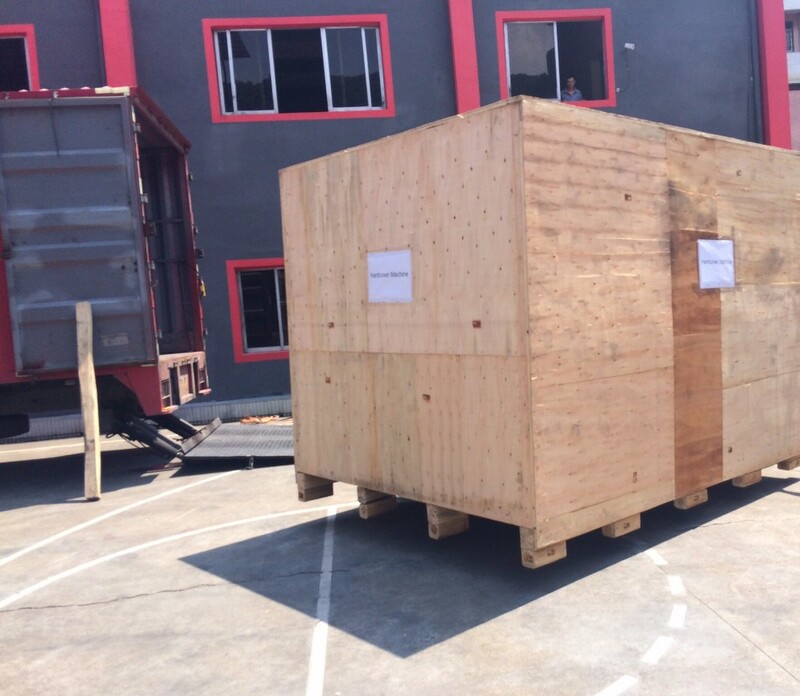 We have always been dedicated to developing packaging equipment such as Case Maker, etc. since it was established. 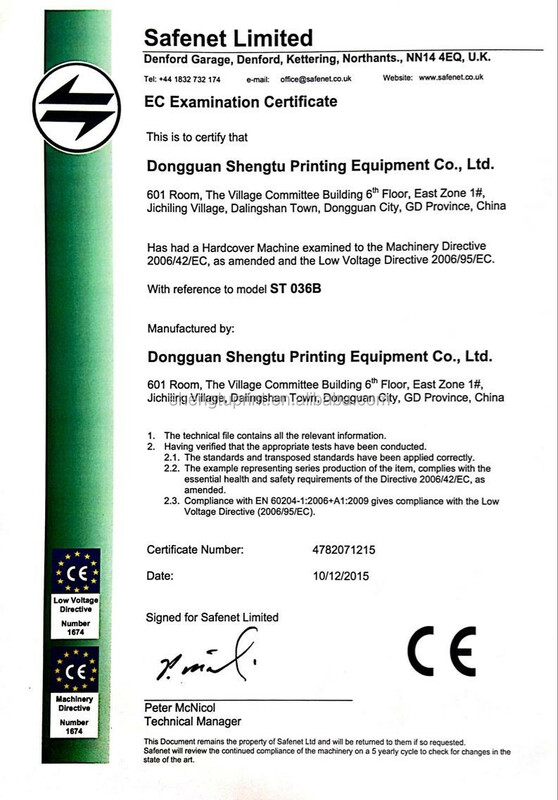 Now we have owned a series of model such as ST036B, ST036XL, ST036H, ST040PP, ST055PE, ST440, etc.